Home / Fluoride Water Filter / HOW BAD IS FLUORIDE? There is no doubt that fluoride has gotten a bad rap with many. Drinking it is definitively a bad idea. It has already been proven that it is bad for babies. In addition, fluoride is a carcinogenic. Most of the health issues related to fluoride come from ingestion, unlike chlorine which can become airborne. Fluoride travels through water which is then swallowed and ingested. In recent years however, the number of people with extreme sensitivities appears to have dramatically increased. Eczema, for example, is reported by many to be greatly aggravated by fluoride exposure. A growing number of people are deciding to remove it from all their household water. Drinking it however presents different problems. It has been found that prolonged intake at high levels can bring about the higher risk of brittle bones and fractures. water, toothpaste, bottled teas, dental gels, and even fluorinated pharmaceuticals. When you combine all of these sources together, that is a lot! 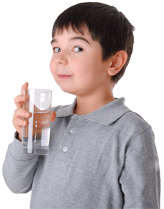 We have many kitchen water filters that work on fluoride, so you are not drinking fluoride contaminated water. Why wait? Your family uses too much water in a day to not take this safety precaution. Friends of Water guarantees everything that they sell. If you’re not totally satisfied, you can return your purchase within 90 days with a full refund- including the original shipping cost.